Meet the first Israeli Ethiopian woman to be elected as member of the Knesset: After the results of the Knesset election were in, Pnina Tamano-Shata, a lawyer, news correspondent and 14th on the Yesh Atid Party roster, realized she will become a member of the 19th Knesset. According to pre-election polls, Yesh Atid, led by Yair Lapid, was expected to win 13 Knesset seats, making Tamano-Shata's admission to parliament questionable. But Yesh Atid, for which this was the first election, demonstrated surprising popularity, as it drew the second largest number of Knesset seats (19), thus admitting Tamano-Shata to the Israeli parliament, making her the first Ethiopian woman ever elected to the House. "Two days before submitting the party's Knesset candidacy to the Central Election Committee I didn’t know where in the list I was placed, but it didn’t really matter because I knew I was going on a journey I really believed in," she said. "When I heard I was salted at number 14 I was happy, because I think it means something. It wasn’t a star-studded list, like some people expected it to be; it's a very diverse list." 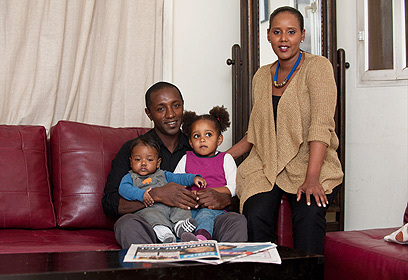 At the age of three, Pnina emigrated from Ethiopia as part of Operation Moses. Under "date of birth," her Israeli ID reads November 1, 1981 – a date she picked out herself, as there were no accurate documents indicating her date of birth. Tamano-Shata spent the first few years in Israel with her family at a facility run by the Immigrant Absorption Ministry and in 1988, the family moved to Petah Tikva, where she has been residing ever since – nowadays with her husband and her two children. "I'm a boarding-school girl," Tamano-Shata said. "When we came to Israel, the state policy was to send Ethiopian children to schools far from home, due to socioeconomic issues. My parents had very little money; we were poor and the move to Israel was not an easy one. "When I was seven, I switched to 'adult mode.' I was my parents' voice, standing up for their rights when people would cut in line or disrespect them." When she was 11, she started working, without telling her parents, at various odd jobs. She'd often be mistreated, but according to her, "Looking back, I think it just made me stronger – being part of the low class, witnessing discrimination. I learned early on to fight for my own rights. That biography has made me who I am today." She is the granddaughter of Kais Shato, one of the spiritual leaders of the Ethiopian Jews. "I guess we have leadership in our genes," her elder sister, Dvora Nativ, told Ynet. "Early on, it was clear that she is sharp, bright and daring." When she told her family she was planning on joining the Yesh Atid Knesset list, her announcement was met with ambivalence. "On the one hand, we were all very supportive of Pnina's political inclination," Dvora said, "but on the other hand, we weren’t sure that Yair Lapid's party was the right place for her. I hold rightist views... and I had a problem with Lapid's positions." Eventually, after inviting her family members to Yesh Atid conferences, Pnina managed to change their minds. Tamano-Shata stood out as a bright young woman as early as in high-school, when she was admitted to a program for gifted students. She continually utilized her abilities to fighting injustice, and when she concluded her army service, she pursued a law degree, during which she became the president of the Ethiopian Student Union, working to abolish discrimination. After her internship at a law firm, Tamano-Shata turned to the media and became a Channel 1 correspondent. Senior channel correspondent Uri Levy, who co-anchored a current affairs program with Tamano-Shata, recounted that when she arrived for an interview, "We immediately realized she had immense talent, knowledge and analytical abilities. I've always known she'd make it to politics; Pnina is a person with great social awareness and a will to make a difference." On her part, however, Tamano-Shata felt a little shackled. "When you work for the media you have to remain objective, and I often wanted to take an active part. 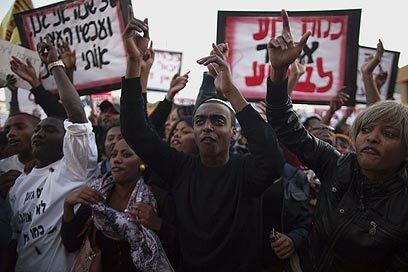 I remember they wanted me to cover the big protest, against racism toward Ethiopians, in Kiryat Malachi. Other journalists would have seized the opportunity, but I chose to take the day off and protest with the people." Her first steps into politics included meeting with several parties. "I got offers from big parties, but I always felt they wanted me as a fig leaf. After I met Yair (Lapid) and heard from him about his social agenda, I realized that Yesh Atid was where I needed to be; it is where I can make a difference. "Even when the polls pointed to a decrease in the public's support, Yair wouldn’t stop believing. He kept telling me I'd be an MK and backed me. I think something amazing happened here. The public could relate to our platform and also, for the first time, two Ethiopian candidates from the same Knesset list will be part of the Knesset – Shimon Solomon and myself, two social activists. "I realize the weight of the responsibility I hold. An entire community of some 150,000 people looks up to me as their hope. They expect me to bring about change and fight racism and discrimination, which both unfortunately still exist in Israeli society. I think we need to exhibit zero tolerance to discriminatory institutions, regardless of whether they discriminate against Ethiopians, Arabs, or anyone else. "There is a large percentage of people with degrees in the community who struggle to find work in their own profession; there are still schools who don’t admit children because of their race; and the Rabbinate still makes things hard for the Ethiopian community. We need to amend existing legislation and at the same time work to legislate new laws to help society be more egalitarian." Despite the inexperience of Yesh Atid Chairman Yair Lapid, Tamano-Shata is not apprehensive about joining a Benjamin Netanyahu-led coalition. "Bibi will have to form a coalition that will adhere to our principles," she said. "So far, Yesh Atid's biggest achievement is in changing Israel's political discourse – we've managed to make the prime minister put issues such as equal distribution of burden and the middle-class as a top priority." Regarding her parliamentary efforts, Tamano-Shata said: "I am most interested in promoting legislation regarding equality and affordable housing." In less than two weeks, Pnina Tamano-Shata will be sworn in as a member of Knesset. 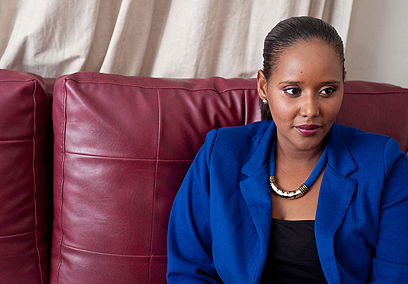 According to Motti Arad, who trained her during her law internship, "I definitely believe she's well on her way to becoming the first Ethiopian woman minister in Israel – if not in this term, then in the next." See all talkbacks "Pnina Tamano-Shata, blazing a new path "